In April 2011 Apple surprised the world of post production when they showed a sneak peek of Final Cut Pro X at the NAB Supermeet. It was obvious that the next version of Final Cut Pro after version 7 was going to be a completely rewritten application – thowing out all previous code and many of the concepts that had worked well for Apple over the previous 12 years. When Final Cut Pro X was launched in June 2011, there were many shocks in store which included an inability to open previous projects, no tracks, many missing features, strange colour correction tools, no ‘source monitor’ and hardly any connectivity with other post apps. After looking at screenshots – which seemed to show much less complexity in the UI, much less congurability and clips that looked like friendly rounded corner tiles – many people dubbed Final Cut Pro X as iMovie Pro. Although Final Cut was launched with updates for Motion and Compressor, many pros were left in limbo when it came to how to interpret what this change in direction meant. Was Apple still interested in people using their software to produce broadcast TV and feature films? Had they conceded that market to Avid and Adobe? Did it show that Apple was going to be happy with prosumers. The huge market of talented people with small businesses who sometime might need a very easy to use but capable video editing software, but not for those that support themselves primarily by editing videos, TV shows and feature films. As 2011 went on, there were few clues from Apple. However much Apple used the word ‘professional’ when promoting Final Cut Pro X, there were many that were unconvinced. How could ‘professionals’ consider an application that doesn’t fit into established workflows? Apple never properly explained the problem they seemed to have with track-based editing. Eventually Apple broke with convention and previewed some of the features that they were planning in the next major update. The implementation of Multicam turned out to be more powerful and simpler to use than any other editing app. The source viewer wasn’t as full featured as many would like, and the updated XML import and export was a disappointment to many third-party developers. The launch of Final Cut Pro X also worried the users of Apple’s professional music app: Logic Pro. Many thought that if Apple followed the ‘Final Cut’ strategy with Logic, they would end up with Garageband Pro X: an dumbed down app for prosumers – which would make life easier for people who only need to work on music very once in a while. An alternative possibility was that Apple would let Logic Pro wither and die – the last major version of the app appeared in July 2009. Was Apple happy with people buying old MacPros, putting them in studio racks and using four year old software? Last weeks’ Logic Pro update provides us with some clues about the future of Final Cut Pro. Remember that although features appearing in Logic Pro X may show that Apple aren’t against them in principle, the same features may never appear in Final Cut Pro X. Given that the early reviews of Logic Pro X say that the user interface may have been redesigned, but it still gives users access to all the power that was available in version 9.1.X and more – while being easier to use. Video editors and motion graphics designers will find Logic easier to use. This clue tells us that as well as supporting prosumers, the ‘Pro X’ apps are designed to be easier to use by post professionals who don’t spend all their time editing video (Final Cut) or making music (Logic). Perhaps Apple doesn’t believe in making apps hard to use so that only established pros in a discipline will want to use them. Also it seems that Apple isn’t against user interface elements that look like real-world devices. Over the last 20 years, audio production software users have become accustomed to seeing UIs based on recreating mixing deck faders, studio equipment, musical instruments and stage equipment. 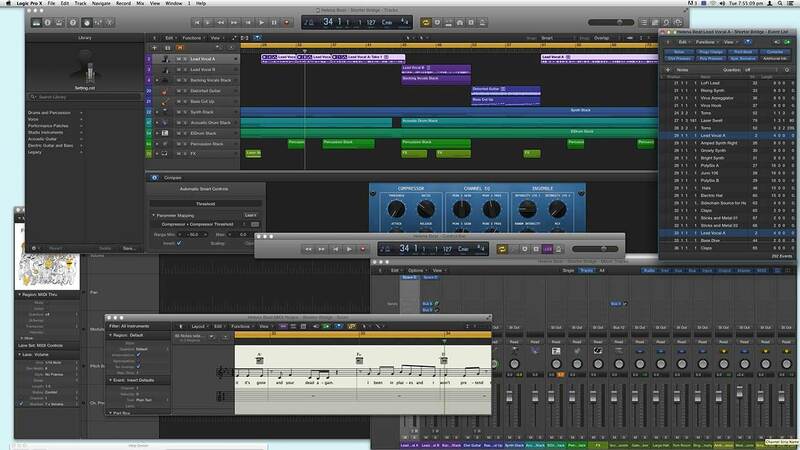 Apple have maintained that tradition in Logic Pro X.
Apple’s website defines Logic Pro X as A complete professional recording studio right on the Mac, Logic Pro gives musicians everything they need to go from first note to final master. The manual defines Logic Pro as a powerful, full-featured music application with all the tools you need to create professional-quality music productions. No mention of sound designers, sound editors, video or feature films. The PDF version of the Logic Pro X manual has 919 pages. There are only 8 pages on using video within the application. Logic then lines up the thumbnails to match the scene markers. Also, if you use ## in a marker name, it use that as a placeholder for the marker number. That means if you name a marker ‘My favourite ##” and it is positioned after ‘Marker 4′ it will display as “My favourite 5.’ If you then move it before the fourth marker, it will display as ‘My favourite 3’. Logic Pro X can import Logic Pro 5 projects, GarageBand projects, MIDI files, AAF files and Final Cut Pro X XML files. Logic Pro X can export AAF files, Final Cut Pro X XML files and Music XML files. In a similar style to Final Cut, it can share projects to iTunes, the media browser and SoundCloud. – 7toX can open XML files exported from Final Cut Pro 6 and 7. – X2ProLE and X2Pro Audio Convert – can convert X XML into AAF files. Apple decided not to spend Final Cut Pro X engineering resources on import and export tools. The quality of Logic Pro Xs import of Final Cut Pro X XML isn’t anywhere near perfect yet. It doesn’t properly import very complex projects. There’s no support of Final Cut Roles. We know this is possible as X2Pro Audio Convert recognises Roles in Final Cut Pro XML. It is more like a statement of intent – it is currently the kind of workflow connection Final Cut Pro Classic used to have with Color for colour grading. 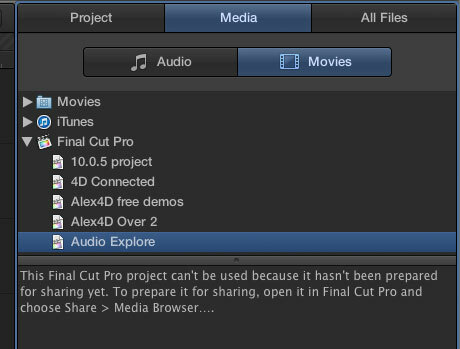 As long as you know how to prepare your timeline for the kind of export Logic X can handle, you’ll be OK.
UPDATE: Take a look at the comment from Michael Garber explaining how to prepare Final Cut Pro X projects so they can be shared via the media browser. They can’t be imported into Logic projects, and Motion application isn’t mentioned in the documentation yet. Over the last few years developers have complained that although the Mac App Store may be great for distribution, they would like to provide upgrades at a reduced price for existing customers. Some commentators thought that once Apple introduced a big update to a Pro application, Apple would also introduce a mechanism for not charging current users the full price for the upgrade. The Logic Pro X update has no special upgrade price offer. That means major updates to Mac apps must be worth as much to current users as the whole app is to new users. Maybe one day updates will be available as in-app purchases. Final Cut Pro X has the least configurable UI of any pro application. There is a single main window with very few palettes. Within the main window you cannot reposition the browsers, the inspector, the timeline or the viewers. You can choose to have a couple of elements fill a secondary monitor. – Can store window arrangements in ‘Screensets’ – which are associated with individual projects and imported from other projects. Each project can store up to 99 screensets. Final Cut Pro X doesn’t yet have any keyboard shortcuts for the number keys. In Logic these keys are used to switch window arrangements. – Can switch between screensets while a project plays at specific points in the timeline (in Final Cut Pro terms, you could switch between window arrangements when playback gets to a multicam section and back again when the multicam section is over). – Allows you to configure the icons, controls and time display of window headers. In Final Cut Pro, content and timelines must be stored in locations managed by the app. All users have control over is which drive information is stored on. – When reverting you can choose which previous version of the project (each which store individual alternatives), whether saved explicitly using the Save command or from an Autosave. Perhaps clips assigned a specific role in Final Cut Pro X will one day appear in clips on separate tracks within a track stack with the same name as the role. – ‘Smart Controls’ can combine multiple plugin controls into a single Smart Controls panel. You can even have a single control modify multiple effect parameters at the same time. This is a simpler version of the way Motion 5 can create combined effects based on multiple filters, generators and behaviours for plugins to be used in Final Cut Pro X. This way of reducing the number of parameter controls that are visible would be useful in Final Cut Pro X when there are many effects applied to a clip. Some of the audio effects in Final Cut Pro X are made up of specific combinations of the audio plugins that are used in Logic. These audio effects are stored inside Final Cut in XML format. The equivalent combinations of plugins used in Logic smart controls aren’t stored in the same format. Apple haven’t released the app that creates the audio combinations in Final Cut yet. Who knows how much cross-fertilisation there is between the Logic Pro and Final Cut Pro teams. They are in the same organisational group. Logic’s antecedent was the best music notation application for the Atari ST over 25 years ago. Final Cut Pro was completely rewritten over the last five years (at least). At least with the launch of Logic Pro X, professionals have further insights into what Apple’s ProApps group consider is an application for professionals. Since the launch of Final Cut Pro X, the world of video editing applications has changed a great deal. Adobe seem intent in turning Premiere Pro into the missing Final Cut Pro 8 that many expected plus some Avid features alongside tighter integration with other apps. Autodesk have stooped down to the pro market by adding editing features to Smoke, while crazy Blackmagic plan to head them off at the pass by adding editing features to DaVinci Resolve, their free colour correction. The next major version of Final Cut Pro X is sure to tell us a lot more about what kind of software Apple thinks professionals need (even if it might not be what pros say they want). Great article. You’ve summed up pretty much everything I’ve been thinking since the Logic X launch. 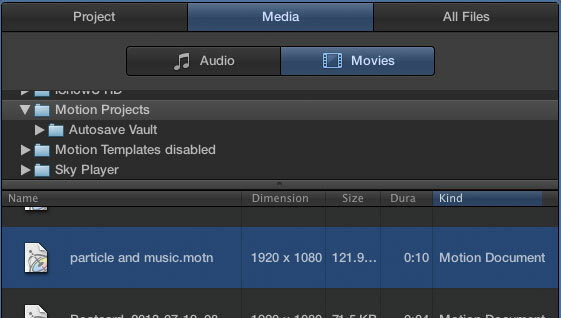 In FCP X, you can currently export a project to the media browser. Didn’t realize this until today. In the share->master file window, select “publish to media browser” from the “when done” puldown menu. All it does is place the exported master file into the share folder of your project, which Logic can see. Yes, skeuomorphism makes sense in an app like Logic. Where the devices you’re emulating are still in use & known by everyone who would use it. But showing an actual drumkit or amp in order to choose features of that emulated amp or drumkit, makes complete sense. I hope you’re right about the track stack under the role name. And about cross pollination in the ProApps Group. Cause for optimism, though perhaps delusional. Dude… you clearly need a better grasp on what Roles are, since they are ALREADY “Track Stacks” (i.e. can essentially be used as such)! You just have to know how to use them. And if that was yet another, tired jab at the ol’ “I needs me some TRACKS cause otherwise it ain’t ‘PRO'”, then yes, you’re delusional. Ain’t gonna happen and those that understand Roles know that’s a GOOD thing. Roles are trackless ‘submixes’ in Final Cut. As audio is 1 dimensional, the Z layer order doesn’t matter. The trick will be for Final Cut Pro X to secretly maintain track information and layer orders when Logic Pro X projects are round-tripped via Final Cut. The fact that audio is associated with video in the main storyline or a connected storyline makes no difference to the sound department. The track layer orders used by sound people to organise their work (and to apply effects to groups of tracks) should be of no interest to video editors. Round-tripping needs to maintain this information while round-tripping. I think trackless video editing is the future. Check out my post entitled ‘Final Cut Pro X: Apple’s bet against track-based editing‘ – I’ll add the link to the main post now. I’m VERY surprised that you didn’t even touch on Logic REMOTE, since having an FCP REMOTE would be absolutely BRILLIANT and it just became number one on my FCP wish-list after seeing what Logic Remote offers! If THAT’S not something “Logic Pro X tells us about the future of Final Cut Pro X” then I will be VERY disappointed! I forgot! I mentioned Logic Remote in my previous Logic Pro X post. I hope Final Cut Remote will show the project timeline on the iPad – you could modify clips and move the playhead from anywhere in the edit suite… That would be a true Remote app! Pffff… screw such piddling tasks (though they are sure to be included, since otherwise it would be pretty nonsensical). I want me a virtual three-ball control panel/color board FOR COLOR CORRECTING or even faders for MIXING or basically anything that would benefit from up to ELEVEN (virtual) MICE (your fingers), such as position parameters etc.! Imagine the possibilities!! Though I’m sure Apple can come up with far better than I could. Regarding prices and upgrade prices: Apple prices the new Pro Apps so cheaply, that it is a no brainer to pay these prices for upgrades. The price for the app has been lowered to the upgrade price. People seem to miss this fact. Final Cut Pro use to cost $1000. The price was reduced to the upgrade price of $299 for everyone. Upgrades will also cost the upgrade price. I’m sorry to say I think you’re being a little over optimistic here. The Logic group seems to still be lead by much of the original team that was acquired when Apple bought logic (v. 5? can’t remember). I think the differences in Logic and FCPX have more to do with that team standing up and refusing to make drastic changes. They also proactively re-wrote the app for 64-bit and Carbon so there was probably less pressure to do a massive re-write. FCP got caught with its pants down when its own company announced they were no longer going to support the core foundation of FCPS. Overall I’ve learned to like FCPX and I appreciate that the time I’ve spend learning Logic wasn’t wasted. However Logic X was such a poor upgrade sound design/post department that I almost wonder if a re-write wouldn’t have been a better thing for my purposes. …but then I may be the only guy who used SoundTrack Pro professional for years and still feels there is a giant whole in Apple’s software lineup now that it is no longer supported. IF there was a SoundTrack X I’d probably be totally happy. I don’t think the Logic team were in a stronger political position than the Final Cut team. The depreciation of QuickTime and the rise of AV Foundation was no surprise to the Final Cut team – they probably contributed to the definition of the new video architecture. July 2009’s Final Cut Pro 7 was a bug fix upgrade (with a new Alpha Transition plugin) while some of the team had probably started on Final Cut Pro X (Apple advertised a job for ‘Video Editor Product Designer, Pro Apps’ in November 2008). Apple have specifically not referred to Logic Pro X as a sound design or post-production tool for film and TV. I hope Apple either fill the Soundtrack Pro gap with a new app, or add post production features to Logic Pro X. 1. Political clout is tied to culture and Apple’s culture (certainly during the Job’s era) centered around strong personalities. A lot of people know Randy Ubillos but how many can name a single member of the Logic team? Logic did not have a leader/figurehead like Ubillos and had less essential legacy code. That way the team could get by with attracting less attention from “the management”. I also read a report from an editor who was brought on to consult with Apple on earlier versions of FCPX and they said there was a lot of divisions and conflict over the direction of the product. Part of the team was pushing for the FCP track based model but updated with modern frameworks (and yes, Quicktime X like you say) while others sided with Randy and wanted the editing model he introduced with “First Cut” (AKA iMovie 09). 2. The impetus for re-writing FCP had (in my memory) more to do with dropping the Carbon legacy framework that was the foundation for FCP and the reason it could not scale well on newer hardware. Yes, Quicktime and AV foundation were part of that need to update Final Cut but the Carbon to Cocoa transition was the real killer. When Carbon didn’t get the update to 64-bit as expected in 2007 the writing was on the wall. Yes, I think that surprised the FCP team (it also surprised a lot of developers because there were alpha versions that never got released). Yes, I think re-writes started even then and conflicts over what the “new” final cut should look like started as far back as that. Meanwhile, Logic had a cleaner and clearer upgrade path as it was acquired in 2002 after OS X was already established and it’s foundation code base seems to have been kept more current. Hence the update to 64-bit was a dot release (9.0 to 9.1) instead of a major overhaul. The major issue in Logic was handling plug-ins not the program itself. This was not true of FCP where a full re-write was necessary regardless of functional/aesthetic changes. 3. Apple has not specifically referred to Logic X as a sound design app because the have not addressed very clear and obvious short comings despite ending previous efforts to overcome those short comings (SoundTrack Pro). Referring to Logic as such would draw attention to the obvious shortcoming. However by adding integration between Logic X and FCPX this suggests it *should* be the preferred post-production companion to FCPX. I find that a frustrating contradiction as I use Logic more for audio and post than for music. Personally I’m happy Logic stayed largely the same and I’m becoming a fan of FCPX; however, I think you’re reading too much into the Logic release and glossing over several large holes. Since the arrival of the new version of Logic (10.0.5) and FCP (10.1) I am strongly interested in knowing if at last, audio roles in fcpx are correctly imported in Logic via fcpxml import. Does somebody tried this ? I haven’t tried it, but if Role round-tripping had been introduced, Apple would have announced it. If you want to learn the new Logic Pro X, then I have the perfect tool. I’m a self-published author and have released a manual for Logic Pro X in my “Graphically Enhanced Manuals” series. “Logic Pro X – How it Works”. The manual is available as pdf file, printed book on Amazon, and interactive iBook on Apple’ iBook Store. Other manuals are for GarageBand X, GarageBand for iPad, Logic Remote, Final Cut Pro X, etc. This is a 70+ pages manual that covers everything that is to know about Automation in Logic Pro X. Written in the same style as my other books in my “Graphically Enhanced Manuals” series, illustrated with rich graphics and diagrams that make the subject easy to understand. The interactive multi-touch iBook version will also be available for free on the Apple iBookstore shortly.